Photo courtesy of Kristian Malvet. To or not to, that is the question. 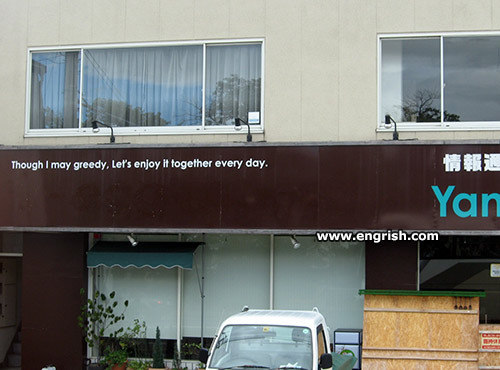 If you enjoy it together every day, you may breedy! The missing letters on the right must be referring to Yamamoto Isoroku. Warm greedy to all our customers! Yu greedy? That’s what Shi likes. Though I may pizza, Let’s cheese eat together every day. DnT: You’re thinking of lust. Though you may greedy, Let’s steal it together every day. Greeding is caring. Let’s share the greed. Envy: It’s not fair, Greed gets to enjoy it every day and I don’t even know what “it” is! Pride: I’m so perfect I don’t need “it” to be happy. All I need is my mirror. Sloth: What’s with all the noise? It’s three o’clock in the afternoon, can’t a guy get some sleep around here? Wrath: EVERYONE SHUT UP OR I’LL KILL YOU!!! Bring your money and enjoy my greedy.